Your stomach contains acids to help you break down the foods you eat. These acids would damage the delicate proteins of your stomach wall, if not for a protective coating of mucous. Gastro-Ease contains a specialized form of zinc plus a patented probiotic strain to support this protective stomach layer. Support a healthy and protective stomach lining, promote a balanced probiotic environment, and encourage healthy, comfortable digestion with Gastro-Ease! Studies show that the trace mineral zinc promotes stomach health in a variety of ways.1,2 And when combined with carnosine (as zinc-L-carnosine), the effects are even more pronounced. This is because zinc-L-carnosine directly affects the cells of the stomach wall responsible for producing the protective layer of mucous. Pylopass™ is a patented form of the naturally occurring L. reuteri probiotic bacteria. These probiotics help to promote a healthy balance of good to bad bacteria in your digestive tract, which can affect the health of the protective mucous layer in your stomach. Support a healthy and protective stomach lining, promote a balanced probiotic environment, and encourage healthy, comfortable digestion with this unique, dual-action formula. 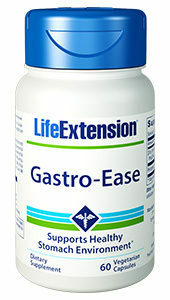 Add Gastro-Ease to your daily digestive health regimen today.